Mon., April 2, 2018, 10 a.m.
OKLAHOMA CITY – Thousands of Oklahoma teachers are expected to descend on the state Capitol Monday to demand lawmakers approve more education funding just days after the Legislature did just that. But some teachers are saying the legislation signed by Gov. Mary Fallin last week was not enough. The measure increases taxes on cigarettes, fuel and oil and gas production to provide teachers with raises of about $6,100, or 15 to 18 percent. Passage followed threats by educators to walk out of classrooms beginning Monday, following the lead of teachers in West Virginia who won a 5 percent raise after going on strike. Teachers in Arizona are now considering a strike over their demands for a 20 percent salary increase. 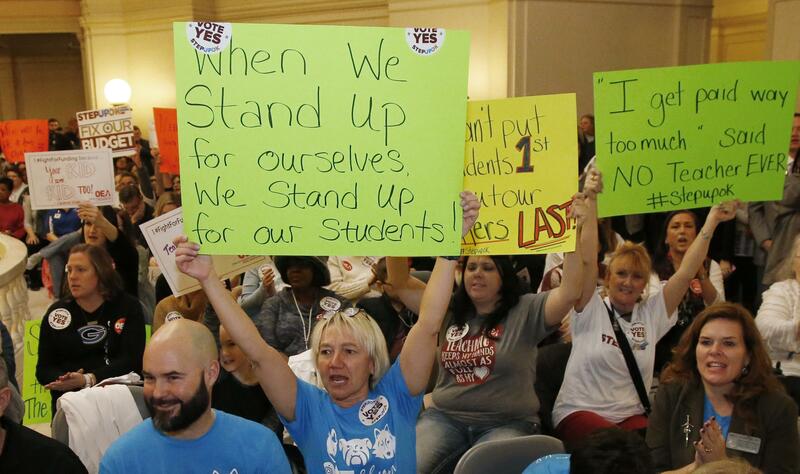 Alicia Priest, president of the Oklahoma Education Association teachers union, said Monday’s rally could lead to a longer walkout as teachers from across the state press their demands that lawmakers approve more funding for state classrooms. The Oklahoma Highway Patrol estimated that as many as 30,000 people are expected at the demonstration. The new revenue measures are expected to generate about $450 million, with the bulk going to teacher raises and about $50 million going to general education funding. The teachers union has called for an additional classroom funding of $75 million. It has also criticized House and Senate leaders for passing a measure repealing a $5-per-night hotel and motel tax that was part of the original education package. Repeal of the hotel tax reduces the total package by about $45 million. “It’s just one more broken promise that our educators have seen over the last 10 years,” Priest said. Many Oklahoma schools, including the three largest districts, Oklahoma City, Tulsa and Edmond, plan to close Monday to honor the walkout. Some schools are offering free meals to students aged 18 or younger while various churches, faith organizations and charitable agencies are providing free day-care services. Published: April 2, 2018, 10 a.m.